Among the greatest of the unwinnable debates among academics is the place of humans in nature. It is discussed around stumps in the field. It is discussed among philosophers. It is discussed with the knowing thump of a fist. It is discussed among each generation anew. We feel now, so separate, so different from them, the other species, the rest of life. Of course we depend on the rest of life. Yet are we really still influenced by life’s fates in the way that, say, an oak tree might be? Surely if civilization gets us anything, it is a modest distance, a remove from the wax and wane of wild populations. The good news is that this is an empirical question, a question with a measurable answer, an answer that is most concrete in light of the story of humans and pathogens. Right now, when we think of pathogens, we think of Ebola. But Ebola is just one of more than two thousand species that afflict humans. In this, humans are special. The average primate is afflicted by just fifty pathogens and parasite species. We have the potential to be exposed to no fewer than forty times as many. But what Ebola reminds us of is that, at least to some extent these pathogens seem to differ among the regions of the Earth. But how much and why? In a study several years ago my friends and I were able to show that the number of kinds of pathogens you might face in different parts of the world is predicted (extremely well) by climate and/or the diversity of mammals and birds. Where climates are warmer and wetter and birds and mammals (alternative hosts) more varied, the number of kinds of pathogens you can be exposed to is greater (Birders beware). Story resolved. We are part of nature. Figure 1: Click sections to enlarge and view legends. But one caveat is that the number of kinds of diseases is not, in and of itself, what is dangerous. What is dangerous is their commonness, their prevalence. The prevalence of pathogens is not simply a function of climate. Prevalence, we were able to show, is also affected by expenditures on disease control. This is the good news. In other words, we have been able to reduce our exposure to pathogens through disease control measures. Malaria is no longer present in London. We are not part of nature. But not all pathogens and parasites are created equally. Some are like Ebola, deadly and fearsome. Others are pinworms, which simply make peoples’ butts itch (which in turns causes them to scratch the pinworm eggs and then, unwittingly, disperse them to other people). What governs which pathogens and parasites live where? 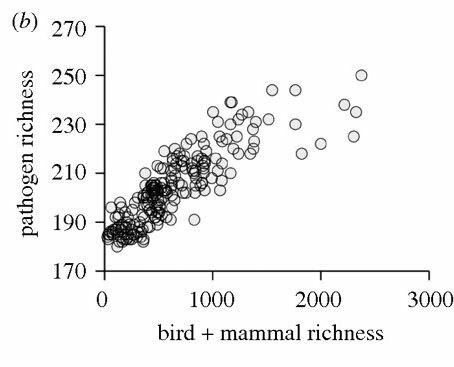 Recently, one of my graduate classes worked on this question, using the best data in the world on the distribution of pathogens (which are far poorer than, for example, the best data in the world on the distribution of warblers). They considered the extent to which the regions of the world could be differentiated as a function of where different pathogens live. 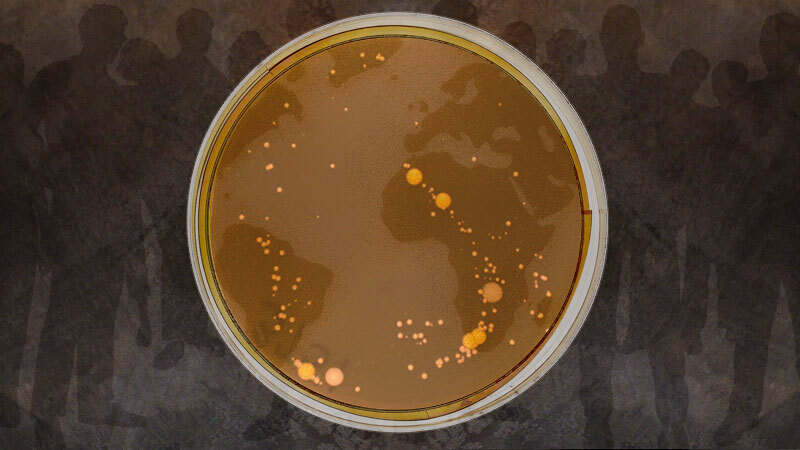 All pathogens might be everywhere (we know that at the extreme this isn’t true, but it could still be “trueish”). Or pathogens might simply be distributed as a function of climate. Perhaps the world can be easily divisible into a tropical realm of pathogens and the diseases they cause and a temperate one, for example. Finally, there was a least likely scenario. The least likely scenario requires a little more explaining. When he was exploring the world’s islands, big and small, searching for new birds and insects that he could ship home to collectors to pay for food, Alfred Russel Wallace, that great co-discoverer of natural selection, noticed that the differences among the regions of the world in terms of their animals (and plants, though he paid less attention to plants) were not continuous. Instead of a slow shift from one set of species to another, he found breaks. Transitions. Hard lines. Edges in a fluid world. Wallace considered these breaks to denote the boundaries of biogeographic zones, zones we now know to reflect the ancient separation (and shifts) of continents and then, more modestly, the occasional trespass among those continents. What Wallace figured out was that in order to account for where things are you needed to know much more ancient histories, histories it would turn out, tens and even hundreds of millions of years old. In theory, the third scenario was that the distribution of pathogens might reflect these ancient biogeographies. Why might this be the case? If pathogens are limited enough by the non-human hosts and vectors on which they depend that they still, to some great extent, live where they first evolved. Why would any of this matter? Who cares? Well, every biologist who has ever debated the relationship between humans and nature, but also anyone who is interested in the status of the human world. It has been well-documented that the composition and prevalence of pathogens in a region determines more about the fate of that region than nearly anything else. Regions differ in their economic success, political stability, life expectancies, culture and much more all as a result of which pathogens are present and which are common. If the world could be simply divided as a function of which pathogens are where, this would be among the most fundamental divisions we could make, far more concrete and consequential than the simple concepts of developing and developed or first and third world. 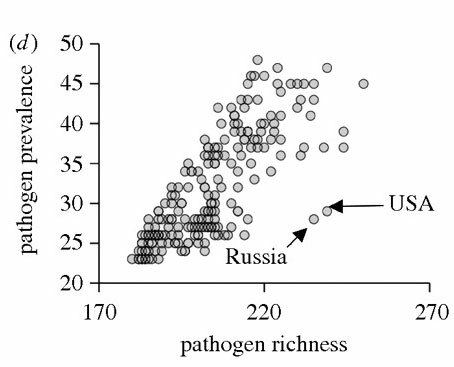 To test these possibilities, Michael Just and the other students in my class examined the ways in which pathogens were clustered, whether they showed a biogeography of hard lines or smooth transitions. They considered the patterns for two separate groups of diseases caused by pathogens. First for those diseases caused by pathogens that are vectored, carried person to person, by animals such as mosquitoes. Such pathogens and their diseases might be expected to be the most likely to show strong, historical, biogeographic patterns, or at least patterns that relate to climate. Then they considered the rest of the pathogens. What the students found was that diseases caused by pathogens without a vector, biogeographic regions exist and that those regions broadly reflect the biogeographic regions for birds and mammals. But the regions for diseases caused by vectored pathogens were even more concrete, as strongly circumscribed, in fact, as those for birds and mammals. In other words, which pathogens you encounter in different parts of the world is influenced by ancient history, by the history of dirt and life. If these pathogens have any say (and they do) we are very much part of nature and millions of years of its evolution. Map showing the seven biogeographic regions identified by Just and his colleagues for 93 vector-borne human-associated diseases (e.g. Lyme, malaria). But there was a caveat, one way in which we seem to have asserted our separateness. Those regions once part of colonial Britain together form their own biogeographic region when it comes to vectored pathogens. The British are coming, and they are bringing their germs. Interestingly, recent work on the biogeographic regions of plant pathogens, suggest the British inadvertently created their own biogeographic region for plant pathogens as well. Once more, the queen and her kingdom are in a realm all their own, one defined by some complex mélange of Christmas pudding, flu, cold, and syphilis. We haven’t formally tested it, but I’ll posit here that these biogeographic regions, the British colonial region and all the rest, have more impact on your life than almost anything else you might map. You are not what you eat, you are what eats you. Wow, that last bit about the British Empire ecoregion is amazing! Sweet work, Rob. And I love the way you always credit your students so prominently. 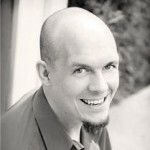 Model scholarship and teaching.